Know Your Lore: The Shal’dorei, a playable race? It’s about that time in an expansion’s lifetime that we begin looking forward to the next. New expansions typically feature one of two new things: A new class, or a new playable race. Either way, each prospect also introduces new lore. In the past, each playable race has been tied to the expansion in a tangible way. Pandaren obviously featured heavily in Mists of Pandaria. Goblins and Worgen joined the Horde and Alliance respectively as part of Cataclysm’s story. Death Knights were intricately tied to Wrath’s story. Legion’s story hasn’t quite come to its conclusion – we’ll need the Antorus raid for that, at least. 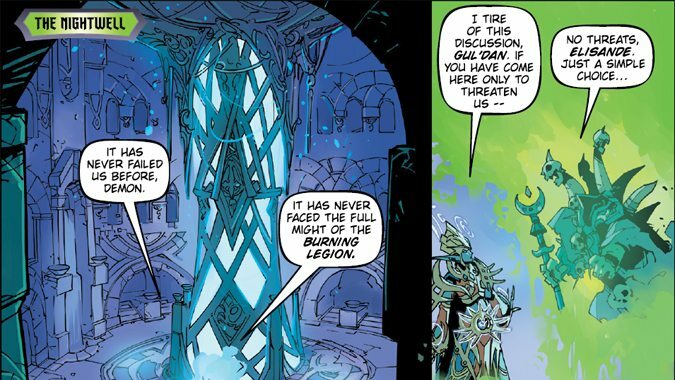 Yet the release of Argus isn’t just about the Eredar homeworld, just like Legion hasn’t been the Burning Legion’s tale. And in between all fighting all the demonic forces the Legion has to offer, there are hints to be found at what might be coming next. The most logical of these? A new player race we’re now intimately familiar with – the Shal’dorei. The Shal’dorei, or Nightborne, were originally Night Elves back in the early days of Kalimdor. Over the course of Legion we learned their story. 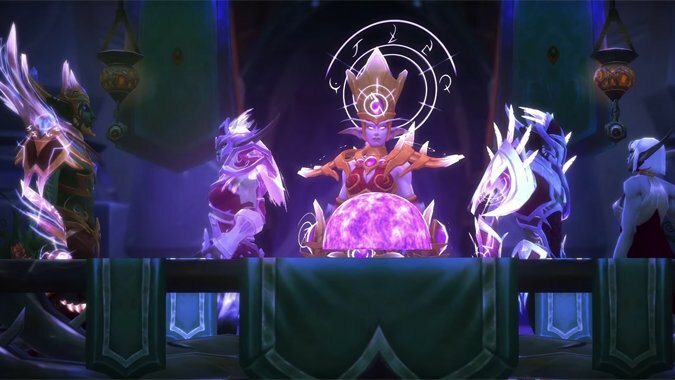 When faced with the reality of Queen Azshara’s bargain with the Legion, these Night Elves chose to seal themselves behind a magical barrier for protection. It turned out to be a good option, because the Sundering destroyed nearly everything surrounding Suramar. Behind that bubble, they assumed that the rest of Azeroth was in ruins – so they remained there, in self-imposed exile. But once supplies began to dwindle, they realized they needed to come up with a way to ensure their own survival. Using their substantial arcane prowess, along with the Eye of Aman’Thul, they created the Nightwell. This magical font differed from the Well of Eternity and the Sunwell. Rather than just being a source of power, it was a source of sustenance. 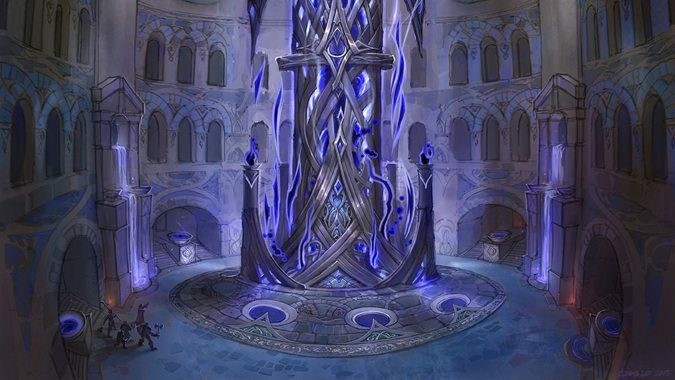 Without the Nightwell and the Arcwine it produced, the Night Elves would slowly starve to death and wither away. 10,000 years behind a magical bubble took its toll, however. Shielded from even sunlight, these Night Elves slowly evolved into an entirely different race. The Shal’dorei thrived, however. Over the thousands of years they were shielded away, they perfected their spellcasting. And as a result of their isolation, they existed as almost a preserved example of ancient Kaldorei society. All of this would change in Legion. When Gul’dan ushered in the Legion’s arrival, Suramar didn’t go unnoticed. For the first time in 10,000 years, Suramar was under direct attack – and it was one they could not possibly survive. Gul’dan offered the Shal’dorei a deal: Let the Legion in as allies, give them the power of the Nightwell, and live. Deny the Legion access, and die. It wasn’t much of a choice. Grand Magistrix Elisande pondered all options, and chose the only logical one that would continue to preserve her people’s lives: Allegiance. This choice didn’t sit well with all of the Shal’dorei. First Arcanist Thalyssra was a vocal opponent of the decision. Her protests were rewarded with an attempt on her life, and exile from the city. Yet Thalyssra didn’t give up. Despite the ever-present threat of withering away, she led a rebellion against her former home. There were others in Suramar who didn’t agree with Elisande’s decision – people who wisely kept their mouths shut. Yet they secretly helped Thalyssra stage her rebellion from the inside. 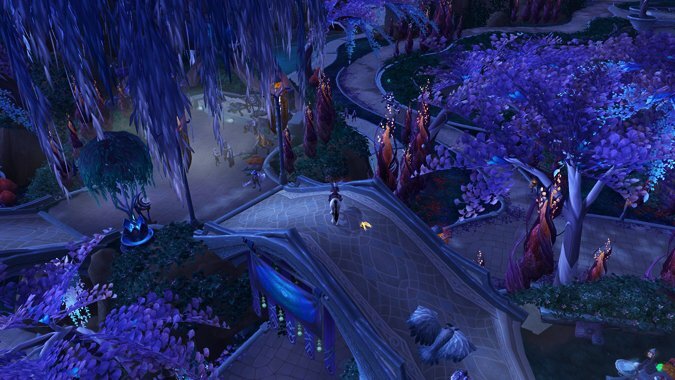 Over the course of Legion, players sneak into Suramar and help that rebellion flourish. By the end of the Suramar storyline, players are staging an attack against the Nighthold. And when the dust settles, Thalyssra and her forces are victorious. With the help of Azeroth’s finest, they defeat Elisande and push the Legion from Suramar. More importantly, they cultivate the Arcan’dor, a magical tree. The fruit of the Arcan’dor does what many thought impossible – it cures the Nightborne addition to the Nightwell. The Shal’dorei will wither no more. 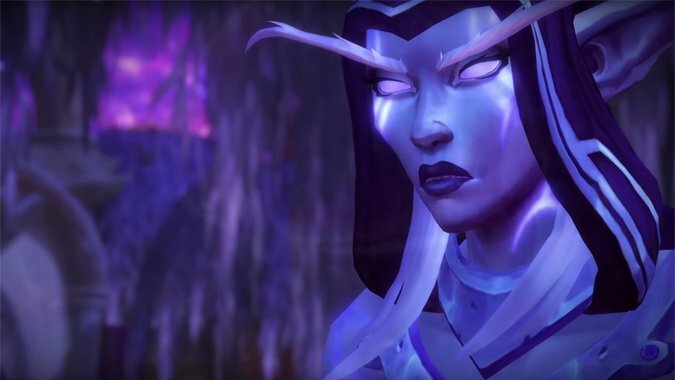 If the story of the Nightborne is apparently over, why make them a playable race? In fact, it’s that very story that puts them in a perfect position to be one. Every new playable race and class in each expansion to date has had a story revolving around their introduction to the game. Unfortunately, that story usually suffers a little in regards to depth. The Worgen were given a brilliant opening sequence, and then quickly shuffled off to Kalimdor for leveling. The Pandaren of the Wandering Isle never return after leaving – save for Monks in Legion. What we have been given with the Shal’dorei is a complete, elegantly told tale that explains exactly where they came from, and who they are today. Starting zone quests tend to suffer, because they’re being developed for new players. The focus of expansion development is naturally more heavily on leveling and end-game content for current players. New races are given just enough information to be interesting, but not necessarily emotionally investable. You’re given a little information, a taste of what these new races and classes are. That’s not a bad thing at all. And Blizzard’s been very good about making these new starting zones interesting. But with the Shal’dorei, we’ve suddenly got the entirety of this ancient race’s history developed and revealed. We’ve interacted with them on a far more personal level than any other race to date. And the nature of their success on Azeroth is partially due to our actions as outsiders. We’ve helped them win – we’ve helped them survive. We’ve saved them from a terrible, inconceivably horrific fate. If the Shal’dorei ever needed a reason to join us in our adventures, we just gave them a really good one. By working the Suramar story into endgame, Blizzard has also managed to do something new. They’ve essentially written the starting zone into the expansion prior. They don’t necessarily need to come up with a new introduction for the Shal’dorei. We’ve already got one. We know who they are. Starting Shal’dorei could begin by helping to rebuild Suramar – a place that already exists in game. Or, for a more intriguing angle, they could play through the rebellion we just finished, only from the opposite side. Instead of being an outsider infiltrating Suramar, you’re a citizen of Suramar, helping that rebellion from the inside. And because the Shal’dorei were helped by both Alliance and Horde, it puts them in a position similar to the Pandaren in Mists – a position where they are free to choose. Shal’dorei could start as a neutral race, just like the Pandaren, and choose their side at the end of the starting experience. Although they might need a little more persuasion for once side in particular. That’s where Legion hints come in. Players adventuring in Argus may have noticed a familiar face on the Vindicaar. Silgryn is the first Suramar resident players encounter in the Suramar quest chain. A former member of the Duskwatch, Silgryn is instrumental in the rebellion, joining the Nightfallen in their efforts to liberate the city. And after all of that is taken care of, he steps onto the Vindicaar for a flight to another world. Players can find Silgryn behind the mission table on the lower level of the Vindicaar. 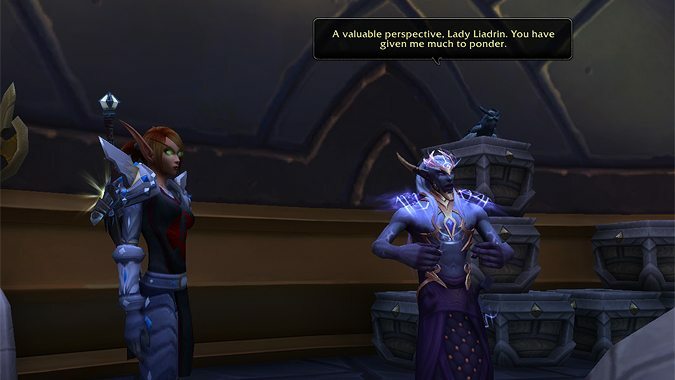 If you speak to him while in Krokuun, you get a dialogue option that offers you the chance to “stay awhile and listen.” The resultant conversation with Lady Liadrin is telling. Silgryn says: In my entire lifetime, I never left the borders of Suramar. To see this place is to understand the fate that almost befell my people. Lady Liadrin says: And nearly mine as well. The sin’dorei also had a leader who struck a bargain with the Legion, poisoning us in the process. Silgryn says: An unbridled thirst for power is the most terrible corruption of all. How did your people find their path forward? Lady Liadrin says: We banded together to fight for our place on Azeroth. And we realized we needed allies to stand with us. Silgryn says: And has the Horde served that purpose for you? Lady Liadrin says: It has. Make no mistake, ours has not been an easy road, and we have struggled through dark times. But together we face a world that has often turned its back on us. Together, we find strength. Silgryn says: A valuable perspective, Lady Liadrin. You have given me much to ponder. Interesting that Silgryn is taking an interest in Horde matters, isn’t it? It’s something we’ve seen before. At the end of Wrath, a couple of different scenarios played out in areas that had little to do with Northrend. 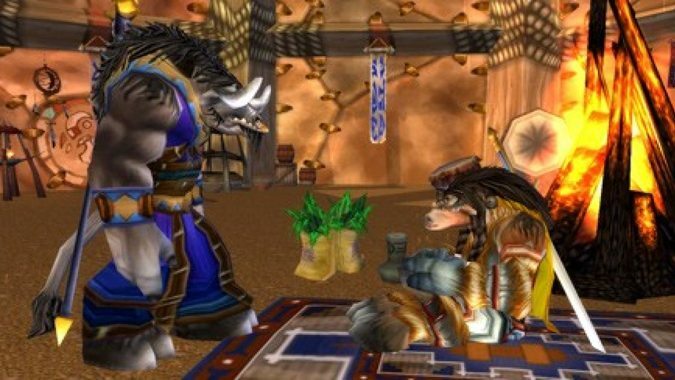 In Thunder Bluff, a Tauren named Aponi Brightmane had a conversation with her friend Tahu Sagewind. They discussed the possibility of An’she’s forgotten teachings. In Darnassus, a Shen’dralar representative – a Night Elf Mage – named Mordent Evenshade waited to speak with Tyrande. In each case, we saw it lead to new opportunities in game. Priests and Paladins were made available to Tauren in Cataclysm, and Night Elves could finally be Mages. It’s not entirely out of line, then, to presume this little conversation between Liadrin and Silgryn is leading up to something similar. The Shal’dorei have a logical reason to join the Alliance – they are, after all, representatives of ancient Night Elf society. Yet they don’t have that same connection to the Horde. With that one little conversation on the Vindicaar, suddenly that connection has been established in a feasible and meaningful way. Obviously we won’t know for certain if the Shal’dorei will be playable until the next expansion is announced. But if the Shal’dorei do end up being a playable race, this may represent a new direction in Blizzard’s storytelling. The story of Suramar was ultimately satisfying, and one I was disappointed to leave behind. It struck a chord with me like no other playable race or class has before. We’ve got the once upon a time here — it’s been presented courtesy of one of Blizzard’s best expansions to date. I’m hoping we aren’t being delivered a happily ever after – instead, just the first of many chapters in the compelling story of the Shal’dorei.